How do I clean the rollers? 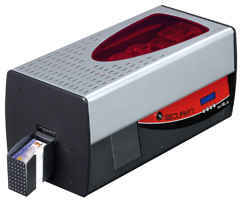 When cleaning inside the printer is required (after every 800 cards), the message NEED CLEANING appears on the display and the LED shows a steady red light. This message is a warning indicating that the operator needs to run through the cleaning cycle. Turn the printer on and open the cover. Inside the printing module, press down on the latch to unlock the print head bracket and tilt it to the right until it reaches the vertical position. Remove the ribbon and then close and lock the print head bracket. Remove any cards found in the feeder. Insert the alcohol-impregnated cleaning card into the feeder. Using the lever, set the card thickness to the MAX position. Put the input feeder back into the printer by pressing on the upper section until it clicks. Enter the menu on the display unit by pressing any key. Select the CLEANING menu, press OK, select PRINTE and confirm with OK.
At the end of the cycle, the cleaning card is ejected. Take a special adhesive cleaning card and remove the 2 protective films on the front and back of the card. Check that there is no film in the lamination module. If yes, remove it carefully. Press OK on the menu and insert the adhesive cleaning card in the opening above the output hopper on the left side of the printer. Once the cleaning cycle is over, the used card is ejected from the printer. Put the film back in the lamination module. Inside the printing module, press down on the latch to unlock the print head bracket and lift it until it reaches the vertical position. When it has dried, place the cleaning roller back in the printer. Place the ribbon back and close the print head bracket and printer cover. Turn the printer off using the ON/OFF switch on the rear panel. Open the printer cover then unlock the print head bracket and tilt it to the vertical position. Locate the print head, and gently rub the cotton bud from left to right along it for a few seconds. Lower the print head bracket and lock it in position. Close the cover and switch the printer back on. Your printer is once again ready to use.